The One Mile Project: Saintly City Trees — Where’s your favorite? From home to work is usually a lovely walk. Flat city sidewalks shaded by old elms, maples, oaks, cottonwoods, basswoods, and the occasional Ginkgo. The trees are so lovely in the Saintly City, we even have a Landmark Tree program. Anyone can nominate their favorite tree. Click here to see last year’s trees, photographed by St. Paul realtor and photographer extraordinaire, Teresa Boardman. The tree to the right is in Coral Gables, Florida where my parents met an eon ago. The tree is growing around the road and the house’s driveway. These are pretty common in the Miami area, I just can’t remember what they are called and my dad’s not answering his phone. My Saintly City, St. Paul, Minnesota does a nice job of emphasizing what they do well — sidewalk poetry, parks, community education, and even trees–all searchable on their website. Walking home today, I basked in the shadows of these tall lovelies. And then I was curious. Oaks, Maples, and Ginkgos I can recognize, but what were the others? Are there any Elms left? What about those nasty, green tree-killing-bugs? I Googled St. Paul trees. Now I know every species the city plants, the trimming schedule, the bug problem and more importantly that the Saintly City knows what her citizens are searching for and provides that information. Coral Gables, well it’s a lovely city, but their website doesn’t tell me a whole lot about what’s planted. Hence I’m crowdsourcing on Twitter and Facebook to find out what’s planted on that odd street in the photo above. 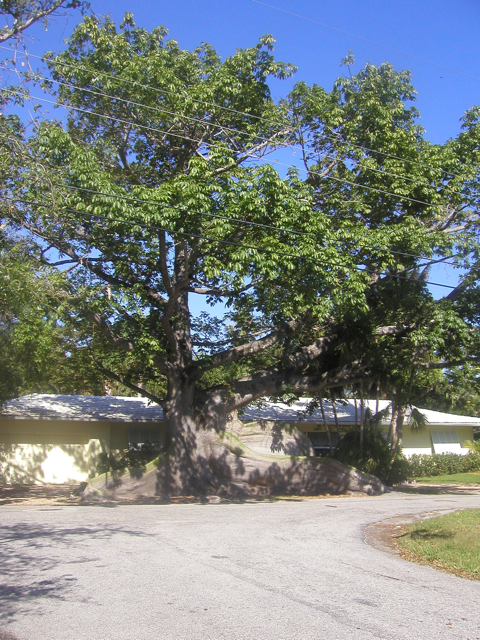 So click on over to the Landmark Tree site and nominate your favorite tree. Or just tell me about it in the comments. P.S. I intended to write about Espresso Royale and road construction, but the journey grabbed me first. I would also like to say that most of those who find themselves with out health insurance are generally students, self-employed and those that are jobless. More than half on the uninsured are really under the age of Thirty five. They do not sense they are in need of health insurance as they are young as well as healthy. The income is often spent on houses, food, as well as entertainment. Lots of people that do represent the working class either entire or not professional are not provided insurance through their work so they move without due to rising tariff of health insurance in the United States. Thanks for the ideas you share through this website.